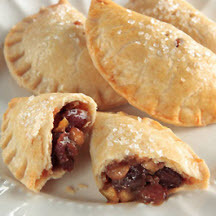 For Raisin Apple Filling: Combine apples, brown sugar, packed, water, lemon juice and raisins in 2-quart saucepan. Cover and cook over medium heat for 5 minutes until apples are just tender. Meanwhile, in small bowl, mix flour, sugar, salt, and spices together well, and add liquid from cooking apples to make slurry. Then, add all to pan with apples and continue to cook, stirring constantly, until thickened, about 2 minutes Remove from heat; stir in vanilla extract and butter. Set aside to cool. For Blue Ribbon Pastry: Measure flour, sugar, salt and cinnamon into large bowl and with pastry blender, fork or two knives, cut in butter and shortening until mixture resembles coarse crumbs. Add water, 1 tablespoon at a time, tossing after each addition until flour is moist and dough just holds together. Turn onto lightly floured surface; knead together and shape into flattened disk. Divide into 4 equal pieces; wrap separately in plastic wrap or wax paper and chill for at least 1/2 hour. On lightly floured surface, roll out pastry dough, one piece at a time, and cut each piece into 4 small rounds with 3 1/2 or 4-inch cookie cutter. Place 1 scant tablespoon Raisin Apple Filling just below center on each piece; moisten edges and fold over, sealing edges with fork. Arrange on baking sheet and prick tops of each hand-held pie in several places with fork or cut one small slit with sharp knife. Beat 1 large egg with pinch of salt for egg wash and brush onto pies. Bake at 375°F (190°C) for 20 to 25 minutes until lightly browned. Cool and serve. Nutritional Information Per Serving (1/16 of recipe): Calories: 210; Total Fat: 10g; Saturated Fat: 4g; Cholesterol: 25mg; Total Carbs: 28g; Fiber: 1g; Sugar: 15g; Protein: 2g; Sodium: 120mg; Potassium: 121mg.